Since stress is considered to be a mental condition, most people feel that it cannot have a direct impact on the health of a person. But medical experts are now confident that stress can increase the undesirable type of cholestrol in the blood. This needs to be taken note of since, cholestrol related problems affect the heart. In this health article, we will talk about stress and how it's relationship with cholestrol. We will also discuss a few important ways in which stress can be controlled. We would like to make people aware of the effects of stress on your health and body. You should ofcourse consult your family doctor before jumping to any conclusions. Many of the suggestions that we make related to stress control, will be useful even for those not suffering from stress. You don't need to wait for the negative effects of stress to take remedial action. When the human body is meets with a situation for the first time or is asked to perform a task with restricted resources in terms of time, experience or even money, the body gets stressed. If your customer informs you that his order needs to be executed quickly, you might get up and start a strict supervision for all functions related to that order. However if the customer tells you that his order stands cancelled if delivery is not made by tomorrow noon, you can get stressed. A mother who notices her young daughter coming home late each day might get worried, however the mind can probably cope with this kind of worry. Now if word arrives that the daughter is wandering around in the company of bad friends until late night, the mother gets mentally stressed. Stress need not come only to elderly people, even school children can get stressed. In this case, the end result might not be cholestrol or heart related but, can affect the performance of the child in studies. A child who is not good in mathametics could get severely stressed each time the maths teacher walks into the class. Classmates ridiculing a child because he is too fat or too thin can also push the child to a stressful situation. An employee worried about losing his job can suffer from long bouts of strain. Employees can also be under persistent stress if they find that, the their own professional training or experience is not sufficient to take on additional responsibility. A boss who is unfair or a boss who is like a slave driver, can also increase the stress levels of employees. Stressed employees normally show a fall in efficiency levels and this will have a negative impact on the organization. An employer can also get stressed, typically bad economy, low worker efficiency, cancelled orders, legal issues and even business competition can cause an employer to get stressed. Stressed employers or bosses often vent their feelings and temper on employees, this is more like passing the stress on to someone else. While this only worsens the condition in the organization you should also know that, a stressed person cannot get unstressed by merely passing on his stress to another person ! When you talk about stress and it's relationship to cholestrol, there is one school of thought that is quite interesting. Some people believe that there is good stress and bad stress !. When you are faced with a challenge at work or at home, you could react in many different ways. The work might have tight time limits as a parameter. You get charged up, feel motivated and excited and decide to take on the challenge. You encourage your staff, motivate them and by the end of the day the work is completed. Your boss is overjoyed there a lot of back patting, hand shaking and smiles all around. You pass those goodies to your staff, you are a hero at least for that day. Some people refer to this feeling and excitement as stress, and call it good stress. But the terminology seems misplaced. Let us presume that you have a manager who is very active and always willing to accept a challenge, you would like to say that your manager is stressed out? The answer is no for sure, so you might say that he is a very capable, active or even a seasoned manager. Stress is a situation where the challenge makes you feel down and overpowered. You start feeling that your boss is trying to destroy your chance of a promotion by telling you to do the impossible. You feel depressed and even consider resigning your job, your mood changes for the worse. This is the type of stress that gets on your nerves and ultimately to your cholestrol level. The point is that we are not debating the issue of good and bad stress, all we are doing is to give the so called 'good' stress a different name. This puts the dangers of stress in the right perspective, medically we give stress the level of importance and attention that it deserves. A kind of win win situation where no one feels let down or confused. The right kind of attitude when we want to ensure that neither party to a discussion or debate gets stressed!. 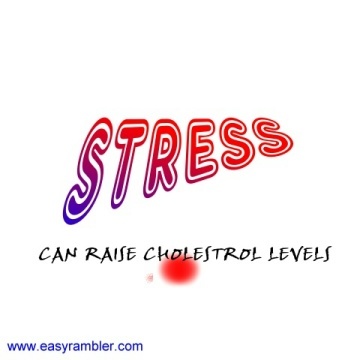 There is a direct relationship between bad cholestrol levels and stress. The medical community might have not yet found the exact reason for cholestrol increase in a stressed person but the fact that it increases is never in doubt. Below are the some of the reasons so far put forward to explain the relationship between stress and cholestrol. A very simple explanation could be that, some peope react to stress by over eating. This obviously could increase weight and cholestrol. But believing that this is the only reason can be dangerous. If this was the only reason why cholestrol increases under stressful conditions, the problem could be resolved by not eating junk food or not over eating when under stress. The second theory explaining the direct relationship between stress and cholestrol levels is more logical. When the body is put through stress, the brain cannot distinguish between mental and physical stress. The body through the liver starts producing cholestrol, as a defense mechanism. The brain tells the body that more effort might be required to face the stress, the cholestrol produced by the liver is expected to be burnt up and 'fight' the stress. Now presuming that this whole condition was for handling mental stress, the burning of cholestrol to tackle the stress will never happen. Most people just sit through stress or try to sleep it out or still worse, go out for a drink or smoke. The unspent cholestrol gathers in the blood and leads to a dangerous condition in the long term. One very good idea is to stay physically active so that most or all of the cholestrol is spent. So how do you handle stress? It is easy to say that prevention is better than cure but, todays lifestyles often encourage the development of stress. The important thing is that you need not and should not wait to be stressed to put some of these suggestions into your daily life. Excercise regularly, and let the routine be a mental relaxant for you. Cycling, walking, weight lifting, running, a game of squash or tennis are some ideas to get you going. Excercise keeps the mind and body in a fitter condition, this allows the body to better cope with stressful situations. You could take the advise of your doctor before starting an excercise routine. Drinking and smoking need to be checked in your daily habits. It is best if you can give up smoking altogether. Drink in moderation and do not make it a daily habit to drink. In any case, eliminate drinking and smoking totally when under stress. Chronic stress is extremely harmful and should be handled with medical supervision if required. If you are always under stress with the fear of losing your job, you might want to consider joining some special evening or night courses to update and upgrade your knowledge. If the source of your chronic stress relates to domestic problems, get a close friend or even a professional family counseler to help. In todays world stress caused by various financial constraints is quite common. There is no medicine or doctoral advice that can resolve this stress condition overnight. There are tonnes of reports, books and seminars available to help people handle financial stress. However the underlying concept is the same, and involves a two prong strategy. The first is to reduce expenses and try to stay and live within your means. The second involves ways to increase family income. This can mean getting better qualified and aiming for a higher paying job or organization. It could also mean a change where, the husband and wife both need to get a job that pays.